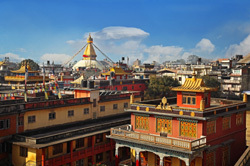 This multi-country tour allows you to get a taste for all three of the countries we feature in the region, with Nepal used as a base to connect up your time in Bhutan and Tibet. You'll see some beautiful Himalayan scenery, and experience the different cultures and atmospheres that make these three close by but contrasting countries so fascinating to visit. The tour starts in Nepal, which is the most accessible of the three countries, and explore Kathmandu's narrow winding streets on a walking tour which takes us to the temples and palaces of Durbar Square. We'll also climb the steps up to Swayambunath stupa, overlooking the city. From Kathmandu we make a spectacular flight over the Himalaya to Bhutan, and the picturesque airport of Paro. As soon as you arrive in Bhutan you'll realise you're stepping into a different world, with ancient architectural styles on nearly all buildings, a much lower population density with many locals in traditional dress, and the real feel of Buddhism permeating the country. 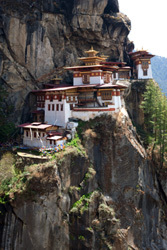 While in Bhutan we explore several 'Dzongs', which in effect are a combination of a fort, monastery and town hall. These are beautiful buildings, and have provided the administration function of Bhutan for centuries, and still do today. We'll also visit several temples and museums in the capital Thimphu, learn about how Buddhism affects everyday life, and drive over high passes on narrow winding roads through thick forests to the scenic Punakha Valley. Our time in Bhutan finishes with a walk up to the iconic Taktshang (Tiger's Nest) Monastery, perched on the side of a high cliff-face. After flying back to Kathmandu (there is no access to Tibet from Bhutan), we have a tour of the ancient centre of Bhaktapur, and spend the night at the village of Nagarkot on the rim of the Kathmandu valley. 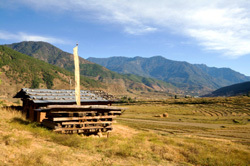 An easy ridge walk through the Tilkot Forest Reserve and tiny Chetri villages with steep terraced farmland on either side takes on a revealing journey through typical rural Nepalese life. The next highlight of the tour is of course Tibet, and after flying to Gongkar airport we transfer to Tsetang, taking the afternoon easy to explore and acclimatise to the higher altitude. You will really get a feel for the size of the Tibetan plateau, and the contrast of the open but mountainous scenery with the Himalayan foothills and peaks of Nepal and Bhutan. After visiting Yumbulagang, originally a palace and fort, and now a chapel on a ridge overlooking the Yarlung Valley, we take a boat trip across the Bhramaputra River to the Samye Monastery before driving on to the capital Lhasa (3750m). 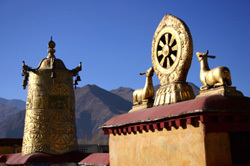 Our guided tours of Lhasa take in the Jokhang monastery and the large open market on Barkhor Street and of course the huge Potala Palace, the former residence of the Dalai Lama, and now a museum. We also visit the Norbulingka, the former summer palace of the Dalai Lama and the Drepung Monastery, once the largest monastery in Tibet with over 10,000 monks. We then fly back to Kathmandu to finish the tour. Note: Tibetan visas are only issued in Kathmandu on 3 days each week, and there is a limited flight schedule between Kathmandu and Lhasa. To fit in with these, this tour itinerary needs to start in Kathmandu on Sundays.